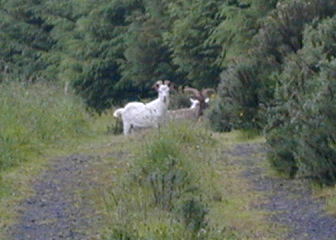 The slopes of Benevenagh are grazed by a herd of feral goats. I've counted about 25 animals of all ages. They are very shy and hard to photograph, because they don't like people and/or border collies and our newshound Tudor is always around and highly interested in this story. The above picture is the best that I could do.